If you need a dependable, long-lasting auger with an industry-best warranty, you need a Meridian auger. When grain is your livelihood you want to ensure it’s handled in a safe and efficient manner. We understand how valuable time can be during the harvest and grain transport stages, which is why we sell Meridian augers that help you save time and money. Meridian augers are built with durable parts and cutting-edge designs that treat your crops with the care they deserve. Meridian are devoted to producing the best auger on the market today, so every auger made is backed with an industry-leading, three-year warranty. It’s time to make your move to a faster, safer and more efficient Meridian auger for unparalleled performance and reliability. Meridian Augers are backed by a 2 year parts and labour warranty. The Meridian Heavy Duty auger models are built to be efficient and versatile, accommodating any job. 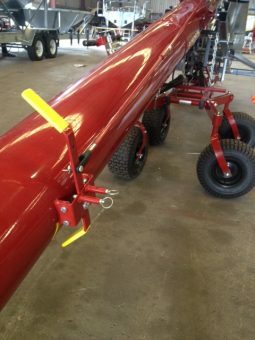 The frame design allows for better weight distribution, which makes it easier to move the auger and provides stability when the auger is operating in the raised position. Self Levelling Mechanical Drive models are designed and built for moving high capacities – up to 245T per hour on our largest models. 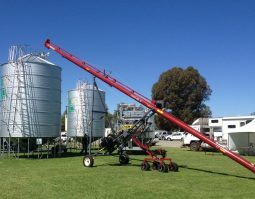 Backed by over 85 years experience in the design, fabrication and marketing of short line grain handling equipment, our auger movers are built strong, stable and versatile. Designed for conventional augers, our two and four-wheel movers have been engineered to fit between most above-ground hopper legs. 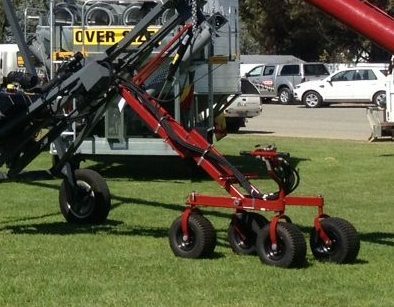 With no undercarriage that connects the walking beams to the auger axle, the operator is allowed unrestricted movement around and underneath the auger. 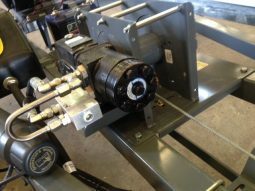 In addition, the mover wheels are set on independent walking beams for increased stability as high-quality gear pumps, attached to a universal mounting bracket, supply hydraulic power to the system. Finally, our unique design helps the operator because, no matter how high or low the auger is, the controls are always at waist level, right in front of you. The gearbox levers allow the auger to be reversed while standing at ground level even when the auger is raised to maximum height. Large fuel and oil reserves and an electric clutch and lead that allows the operator to stop and start the auger drive from the hopper to avoid grain spillage with a second electric clutch switch located near the engine. 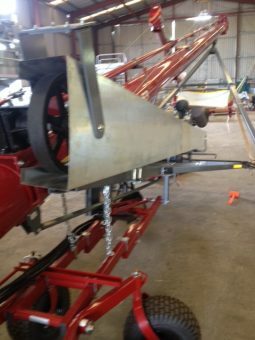 As this is a positive drive it also reduces wear on the drive belts when engaging the auger drive. 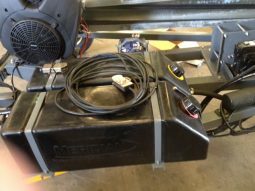 Meridian use a unique 3 section belt to stop slippage as when the usual 3 separate belts are used and are fully guarded with a mid-belt tensioner. All components on Meridian augers are of the highest quality.